Tomatin has been experimenting with expressions that give whisky lovers the chance to taste the same single malt matured in different types of casks, and distillery manager Graham Eunson is at it again. 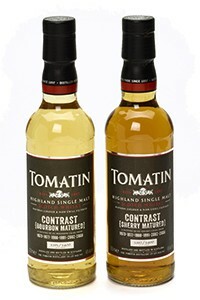 Tomatin Contrasts is a two-bottle set featuring a vatting of the distillery’s whiskies from 1973, 1977, 1988, 1991, 2002, and 2006. One bottle features the whisky matured in ex-Bourbon casks, while the other has whisky matured in ex-Sherry casks. Both are bottled at 46% ABV in 375ml bottles, and the Contrasts package will be available through whisky specialist retailers worldwide with a recommended retail price of £99 ($154 USD). 5,400 sets will be available. Cù Bòcan is the peated whisky from Tomatin, and has also been the subject of experimental releases to showcase the effect of different casks on the overall whisky. The latest release in that series is the Cù Bòcan Limited Edition Bourbon Cask. While the regular Cù Bòcan uses whiskies matured in ex-Bourbon, ex-Sherry, and Virgin Oak casks, this release uses first-fill ex-Bourbon casks exclusively and is bottled at 46% ABV with no chill-filtering or coloring. Only 6,000 bottles will be available with a recommended retail price of £49.99 ($76 USD) at specialist retailers worldwide, with the exception of the US. 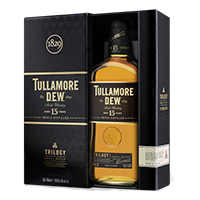 William Grant & Sons’ Tullamore D.E.W Irish Whiskey is releasing Trilogy, a 15-year-old whiskey that focuses on the number three in a couple of ways. The whiskey itself is triple-distilled (at Irish Distillers in Midleton), and originally matured in ex-Bourbon, ex-Oloroso Sherry, and traditional refill casks, then blended and finished in Rum casks. Trilogy is bottled at 40% ABV, and will make its debut at Dublin Airport’s Irish Whiskey Collection shop along with other whisky specialists worldwide. Pricing was not announced. The Irish Whiskey Collection shop is also the only outlet with a special edition of Powers Irish Whiskey. The Powers Aviation Edition celebrates Dublin International Airport’s 75th anniversary in 2015. The Pogues have been making music for more than 30 years, and the band has teamed up with West Cork Distillers to release an Irish Whiskey bearing the band’s name. 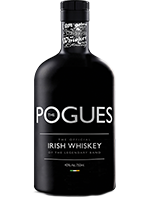 The Pogues Irish Whiskey is described as being matured for “three years and a day”, and is being bottled at 40% ABV for a release in August. The whiskey will be available in the UK at first, but West Cork Distillers spokesman Ger McCarthy told WhiskyCast in an email that distributors have been appointed in the US and other key markets worldwide. Pricing has not been announced. While there might be some confusion among consumers between The Pogues Irish Whiskey and Kentucky’s Old Pogue Bourbon, Old Pogue’s Peter Pogue welcomed the new whiskey. In an email to WhiskyCast, he explained that West Cork Distillers worked closely with Old Pogue ahead of the launch, and since his family only produces Kentucky Bourbon and Rye whiskies, it would have no objection to an Irish Whiskey with the Pogue name. Editor’s note: This story has been updated with reaction from Peter Pogue of Old Pogue Distillery.